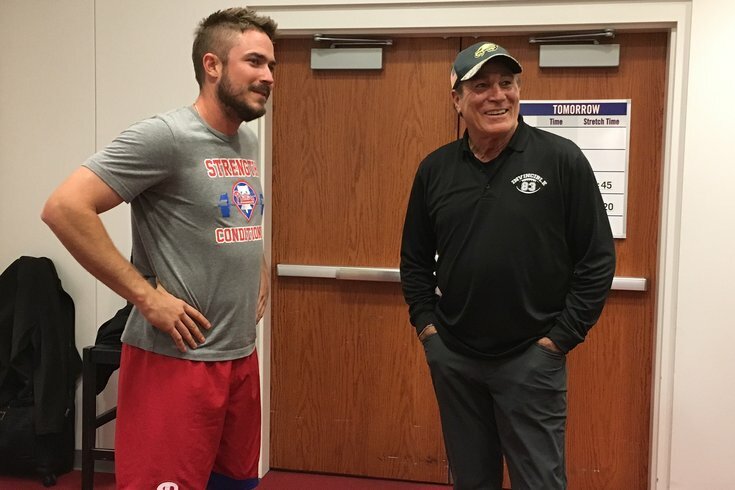 Former Philadelphia Eagles inspirational walk-on Vince Papale gave former Phillies 33-round pick Brock Stassi a copy of the movie "Invincible" on Tuesday afternoon at Citizens Bank Park. The former pro football walk-on reached into his duffel bag and fished out a DVD. And then another. And then a third. Vince Papale had located the correct, personalized copy of “Invincible,” the 2006 movie based on his story as a 30-year-old bartender who managed to make the Philadelphia Eagles roster 41 years ago. Papale took the copy of the movie and handed it to the 27-year-old Phillies rookie who just so happens to wear No.41. Like nearly everyone else in the sporting world, particularly the folks in Philadelphia who appreciate an underdog story, Vince Papale was at his South Jersey home with his daughter watching Comcast SportsNet when the viral video of Stassi began playing. He immediately felt a connection to Stassi, an accomplished college player but one that bucked long odds to make a major league roster as a former 33rd round pick. During the four days between finding out he made the Phillies’ Opening Day roster to stepping on the field in Cincinnati, Stassi got a flood of calls, texts, and twitter mentions. He saw a theme, with fans calling on Papale’s story. Papale played reporter for a second on Tuesday when he asked Stassi what kept him going as an older minor leaguer still hoping for a big league opportunity. Ty Kelly was activated prior to Tuesday’s scheduled game against the Miami Marlins. Kelly, a 28-year-old utility player, is with his third team since Opening Day. He was at Citi Field in New York as a member of the New York Mets three weeks ago, and was claimed off waivers by the Toronto Blue Jays a week later. The Phillies claimed Kelly off waivers on Saturday. Kelly gives the Phillies a full bench again a week after Howie Kendrick was placed on the 10-day DL and the team opted to carry an extra pitcher. In addition to his versatility as a switch-hitter, Kelly has another thing going for him as a reserve: he started at least one game at every position other than pitcher and catcher while with Triple-A Las Vegas in 2016. Kelly did once pitch an inning (in 2014) and had a catcher’s glove in his locker that he got some usage out of while temping as the Mets emergency catcher earlier this month. “The glove would be a little more broken in,” joked Kelly, who hit .328 with a .409 OBP in 8 games at Triple-A in 2016.